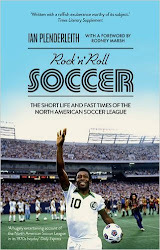 The esteemed football literature web site Of Pitch & Page has nominated Rock n Roll Soccer at number two on its list of eight books to watch out for this autumn, calling it "a must for fans of cult sports stories" (I hope that "fans of cult sports stories" represent a significantly large sector of the reading public, but I suspect not). It's ranked ahead of Matt Dickinson's book on Bobby Moore, Rio Ferdinand's autobiography, and a book intriguingly co-authored by Roddy Doyle and Roy Keane. Number one on the list is Gerry Ferrara's A Season With the Honest Men, a behind-the-scenes romp with Ayr United, so no complaints about being pipped to the top spot by the sort of book that all right-thinking folk would want to read. When I call Of Pitch & Page "esteemed", by the way, I mean that in the same way that my publisher calls me an "acclaimed football writer". That is, I've been acclaimed by my publisher (and my mum), and now that Of Pitch & Page has said something nice about my book, I most definitely esteem it too.